I have been back from the trip a little over 2 days already, and only now can I sit down and finish up the journal from the whole Los Angeles, Las Vegas, and Death Valley experience. As usual, it is always hardest to write about the final days – time becomes so precious, exhaustion sinks in, and by the time I am home, a million “home” things intrude upon my mind and my time. I last left you after telling you about the amazing experience at Badwater and then back tracking to tell you about the day before. This time I will try to be more chronological. I was writing the last section in the van driving from Death Valley to North Las Vegas where we stayed the last two nights of the workshop. We arrived at the hotel about noon, got settled, and almost immediately headed out to the Valley of Fire to shoot for the afternoon. The drive to the shoot was over an hour, but it did not take that long to begin to see the marvels of the Valley of Fire. 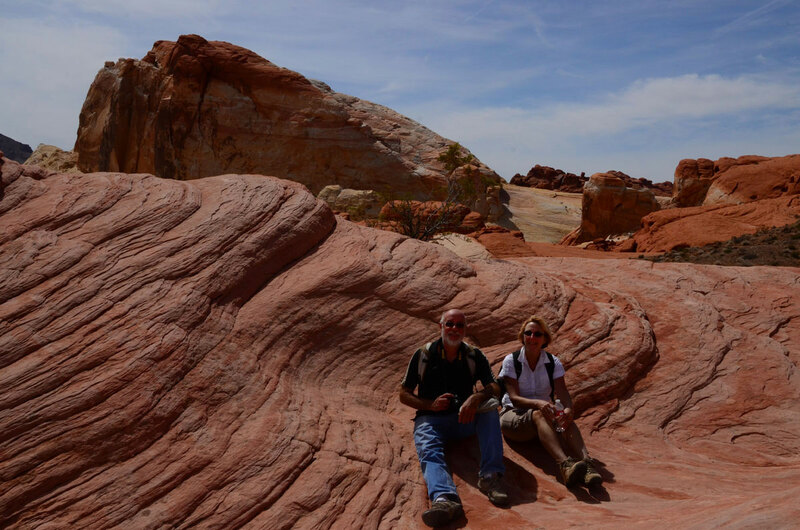 Believe me, if you have a bucket list, put the Valley of Fire on it. If you don’t have a bucket list, get a piece of paper right now and write “Valley of Fire” at the top. Raul managed to design this trip to take us from one beautiful place to another more beautiful place in each successive shoot…The Valley of Fire is the last shoot and by far the most spectacular of the places we have seen on the trip – and that says a lot because I am sure you have noticed how enthusiastic I have been about all of the other places. The Valley of Fire is a state park in Nevada. 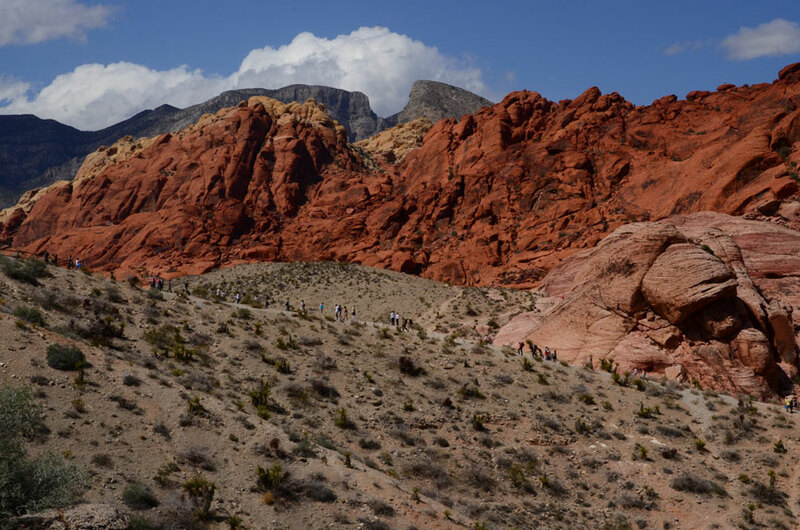 North of Las Vegas at the northwestern edge of Lake Mead, you begin to see the unusual red rocks well-before you reach the entrance to the park. Once in the park, the road winds around a virtual fantasy land, a landscape so strange and colorful, dominated by huge red sandstone mountains of stone. At the entrance, the sandstone is heavily eroded by wind and blowing sand that has created holes in the rocks, and chiseled out columns in the stone. You feel as if so many hundreds of sentinels in the rock are watching you and crying out in anguish. Driving on, the red sandstone begins to mix with other rocks – yellow sandstone, green, pink, white. Designs in the rocks look like pastel fabrics in stripes and swirls. It is had to know where to look, much less photograph, when everything around you is so odd and wonderful. Raul took us to a location in the park, fairly close to the end, where we had a big open view of rocks of all colors surrounding us. The distances between things were deceiving, as they were in Death Valley, and only by looking at the scale of our friends, could we appreciate the size of the rocks around us. We practiced photographing panoramas of the rocks as they changed colors with the sinking of the sun. With harsh sunlight on the rocks, we took a lot of pictures of details – and there were so many different details to try to capture. The stripes of colors in the rocks, no less than the ridges formed by selective erosion, created some shapes that we alternately described as like “hard candies” or like “frosting.” Everything was so exceptionally beautiful. The pizza was absolutely nothing to write home about, and I had full-blown symptoms of Gerry’s cold by then, so the evening was best spent trying to sleep. The next morning, Saturday, we had to be on the road by 5:00am to drive back up to the Valley of Fire to shoot the dawn there. At least that morning, the hotel had the continental breakfast set up for us before we left so we each got a little something to eat or sip along the way. Arriving at the same basic shooting location as the day before, we piled out of the van still in the dark, hefted our camera gear (tripods, bags, etc) and set off walking out over the rocks and sand to a place where we could shoot the morning sun reflected off the rock walls. Everyone was a bit skittish, worried about rattlesnakes (did I tell you that Isabel saw a baby rattlesnake at Artist’s Palette?). No snakes were spotted. We set up and waited for the dawn, and again, a life-changing experience. There we are out in the middle of nowhere, surrounded by dazzling color, both in the sky, as the sun lit up the clouds, and on the rocks as the light warmed their colors, experiencing the beginning of a new day. Trite as it sounds, you feel as if everything is so new and fresh and beautiful, that anything is possible, that you are really starting anew. We shot for a few hours and then set off in the van to find some breakfast. In a town called Overton, where there isn’t much of anything, there was a place called “Sugar’s” where we got a good down-home kind of breakfast. The place was really out there – some of the roughest looking types (even the women) that you could ever hope to see or hear in a diner mid-morning! to kill however we wanted. The light wasn’t ideal for taking photographs, though there were some shots to be gotten. Gerry and I set off hiking around the area, climbing up and down the rocks, crawling through canyons, marveling at the flora, and I, secretly, hoping to see a rattlesnake (from far away!). Gerry thought he saw a tarantula – but I am not sure if he said it just to scare me. The place is so beautiful. It would be so easy to get lost, each new vista drawing you off in another direction to investigate. We vowed we would come back again some time and hike for a few days. Around 2 pm, we returned to North Las Vegas, and had 2 hours to prepare for our critiques. This time we met in the breakfast room, and helped by beer and tequila, we got our final critiques of the trip. It is amazing how well tequila takes the edge off “constructive” criticism! Carol, who was the second one to have her critique, managed to get just a little too much tequila in her system, and at a certain point had to be assisted to her room! Once we got through everyone’s pictures, we did sit and talk for awhile, Raul helped us set up my flash to fire remotely, and finally we all broke up for the evening. Annie, David, Gerry and I went out for dinner together to a Mexican place called Zapata’s. Carol had already retired (as I mentioned) and Isabel got an earlier flight home, Raul and Elle had things to do before Elle’s plane home at midnight, so Raul lent David the van and we four went out. Very nice dinner – a pre-celebration of David’s birthday (on Monday). It had been an exhausting week. Four straight days of getting up before dawn, some days in the frigid cold, others in 60 mph wind, and afternoons in the hot sun: Getting into bed early wasn’t hard. With visions of sleeping in late, wouldn’t you know, I could not fall asleep for the life of me and then woke up early anyway! Sunday morning, the plan was to leave for the airport at 11. Gerry and I found David and Annie still at breakfast, and after a few moments Carol joined us too…she remembered nothing of the evening before! How much fun we had teasing her about the things she did and said! Raul, took the remaining five of us to the airport – dropping Carol off at the first hotel where she left her car. After all our goodbyes, Gerry and I picked up a car at the airport – for the day – since our flight was not scheduled until 11:00 pm. We took advantage of the time to drive out to see Red Rock Canyon, just about 30 minutes from the airport. Red Rock Canyon is classified as a national conservation area. The rocks are similar to those in the Valley of Fire, but nowhere near as impressive. The conservation area has a scenic drive through it though, and on a Sunday afternoon, it was well-traveled and there were hikers and visitors clogging the road. We did not venture off the road ourselves. This was the first day my feet were not encased in my hiking boots – so my footwear was definitely not appropriate. Though the rock formations and the mountains were somewhat of a let down after the Valley of Fire, the visitors’ center is top-notch. 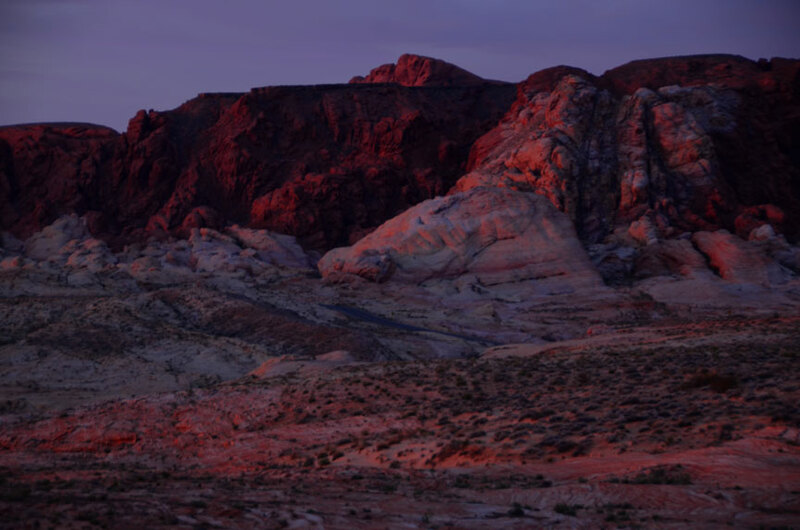 I would suggest visiting this “park” before going to the Valley of Fire, just so you can learn about the geology, fauna and flora of the area beforehand. The exhibits are excellent! I still wanted to see the ghost town, and we didn’t have anything else to do until our 6:30 dinner reservation, so we drove back to the outskirts of Vegas and got on the expressway to find our little ghost town (this would be the one where Clark Gable came to claim the remains of his wife, Carole Lombard, after she died in a plane crash there). I said it was "my first dust storm." I didn't say it was a big one. 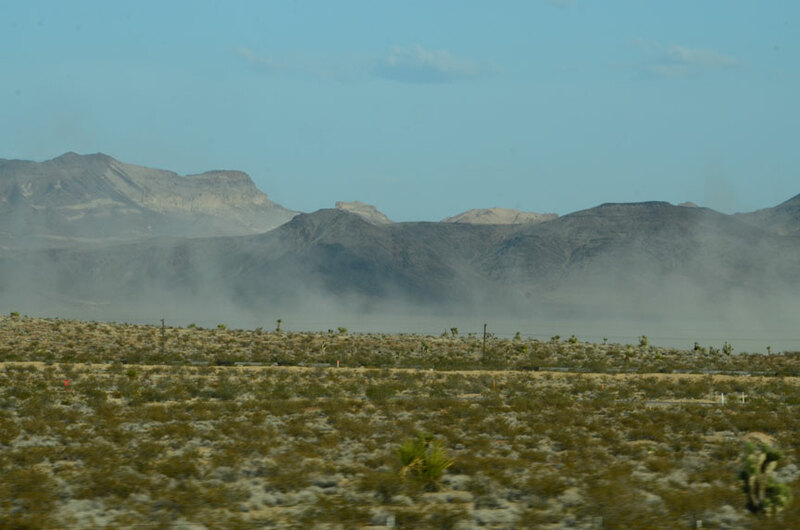 On the way, I saw my first dust storm! The town wasn’t much to speak of – and as far as ghost towns go, well I wouldn’t say it was the best of those either. The abandoned buildings were surrounded by currently inhabited buildings and trailers. A lot of trailers. 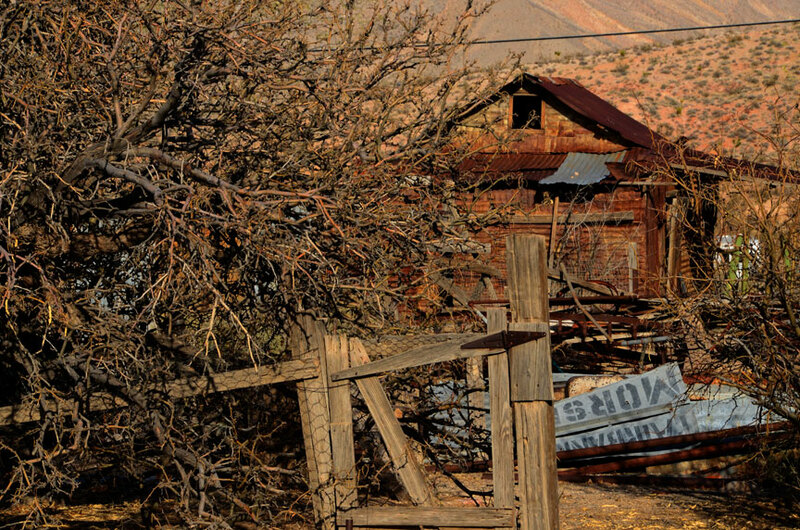 It was impossible to get any kind of shot that evoked the abandoned feeling you want when shooting a ghost town. We stopped at the Pioneer Saloon, a landmark in the town, checked out the Carole Lombard and Clark Gable (memorial) room, had a beer, listened to the live (loud) music and admired more Harleys. So much for that! Back on the road to Vegas and dinner. We had dinner at the most highly recommended restaurant on Trip Advisor for the city of Las Vegas, Roy’s. The service was really, really nice, and though we felt a little under-dressed, it was not because anyone there made us feel that way. The food was very good, and we had a really nice, really good dinner, the first of this portion of the trip since we left LA. After dinner, we returned our rental car and went to the airport early. Yikes! No Admirals Club! We had to sit in the terminal and wait for our plane and I could not keep my eyes open! ntification check) told me that I was a “trusted traveler” and I got to go into a special screening line where I did not have to take off my jacket or my shoes, and I did not have to take out my laptop or 1-3-3 bag! Wow! I couldn’t believe it. Gerry is not a trusted traveler though, so he had to go through the regular line, and I got to sit and wait for him for about 5-10 minutes. Our flight was supposed to be bumpy on the way up due to the windy day, but it wasn’t really bad. We were upgraded and sitting across from each other in first class, and honestly, I don’t remember a thing about the flight. I slept the entire way. I didn’t even know they served food. We got in to Miami about 6:40 am and were lucky enough to get on the next flight to San Juan at 6:55 am, so we were home in San Juan a full 2 hours earlier than our scheduled flight. I slept through that flight too – and arrived home full of energy and went to the office for the rest of the day. It was a great trip, no doubt about it. Each of the places we visited was brand new to me. I look forward to going back and spending a little more time exploring and savoring the landscape. I think I could skip Las Vegas. It is just too crowded for my taste, and I really haven’t as much interest in hotels and casinos, or even shows, as I have in being outdoors, hiking and photographing. Naturally, I will compromise on that as I know Gerry is very much an urban guy who likes the crowds and the things one does with crowds. Small compromise in reality. I just hope we will make it back again. Reading your post and looking at your beautiful pictures I felt like I was there already. Thanks for shearing!